Hello there and welcome to another day of Clearly Besotted teasers. 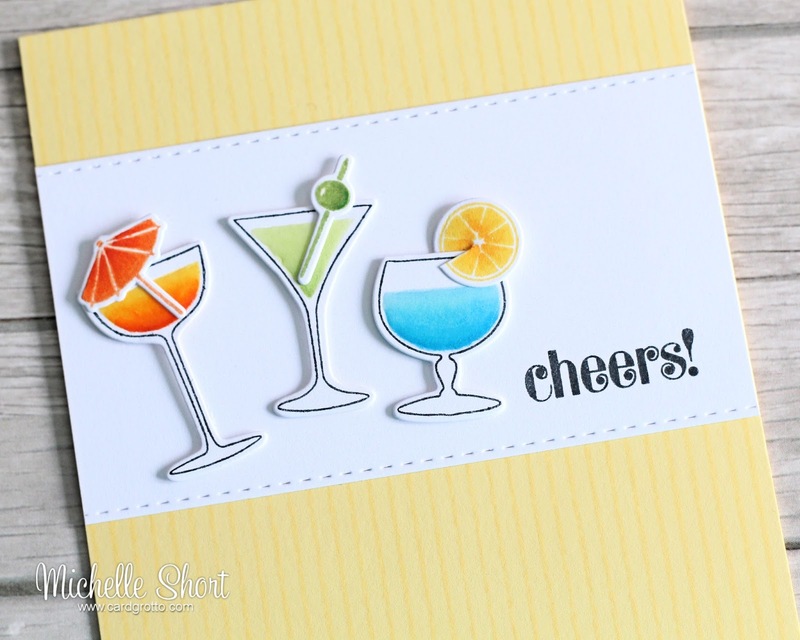 Today I am sharing a fun set with you called Raise A Glass. It is filled with great images of drinks and accompanying sentiments. This set will be great for so many occasions. I started off by stamping the glasses in black ink and then the drink/liquid portion in various shades of Memento inks. To give the drinks some added depth and colour I used my Copic Markers to shade them. I cut them out with the matching dies and added a coat of Glossy Accents. These were then set aside to dry. I also stamped the lemon slice, olive and umbrella, added some shading with Copics, as well as some Clear Wink of Stella. I took a yellow A2 card base and stamped the MFT Pinstripe Background stamp on it using yellow ink. I then added a strip of white cardstock. I wanted stitching on the top and the bottom but I since I do not have a die like that, I cut a SSS Stitched Rectangle and then cut the sides off. The sentiment, from the same set, was stamped on this and then added to the card base. The drinks were added on top with foam tape. As always, thank you so much for visiting me today. I hope you are enjoying the teasers so far. Please pop over and see Stephanie, who will not only have some amazing samples to share with you, will also have links to all the DT and GDT sharing today. See you tomorrow! This card is so cute :) really nice! Now this looks like a stamp set i could get a lot of us from. Love it! 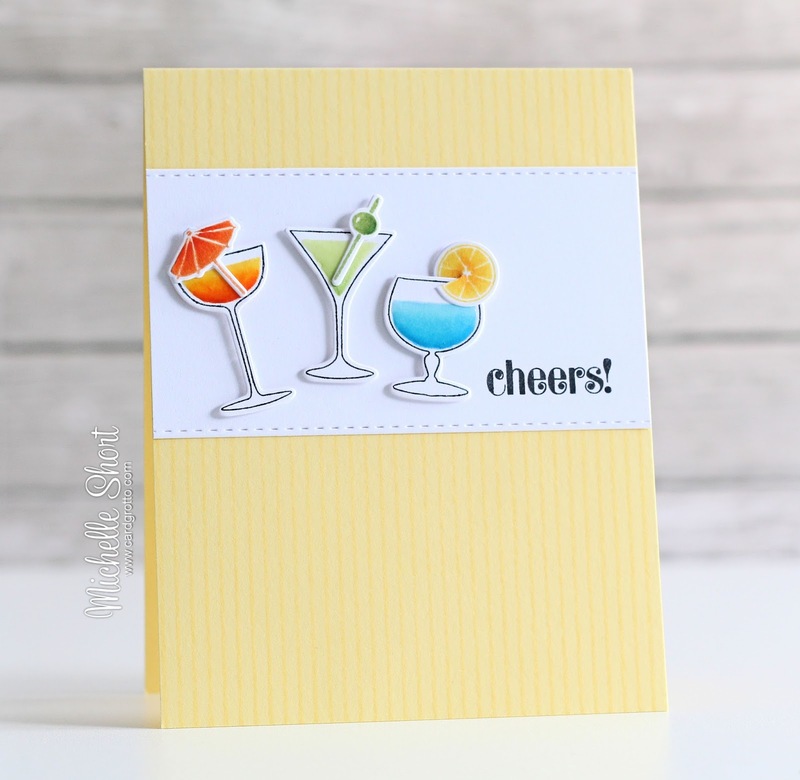 Such a fun and bright card! Fabulous card, Michelle! Gorgeous colors and coloring! It looks like a summer party that everyone would love. We could use some fresh drinks right now (-; Summer has finally started, as it seems. Next week me and my family are going to visit London for a few days. So I hope the weather will be as nice as it is now. Lovely card, Michelle! The colours are just perfect! So cute! Love the little drink glasses! I feel thirsty all of a sudden... Fun and cheerful card! That's a wonderful card and I love both all the little glasses as well as the bright colours. Your great coloring makes the drinks look real and as it's actually very hot here, I could use right now such a cold drink. Oh,i love this card,Michelle1! Beautiful coloring on the glasses,great shading!! What a great card Michelle! Love it!! Think that set will be going in my basket! Lol! !